Many of us want to give our children a view of the world beyond Disney DVD's, but when is the right time to take your child on their first big adventure, and where should you go? For anyone with a hankering for Africa, South Africa is a 'soft' introduction to a continent that can be confronting. The major roads are (relatively) good and there are enough hotels countrywide which are both five star and family-friendly. There's Pumbaa off exploring', says our guide, as a warthog scuttles past our safari vehicle, its tail in the air. He's referring to one of the characters in the animated Lion King film (as anyone with children under 12 will probably know). Proving that even in the actual African Bush you can't escape Disney. To be fair to our guide with a 4WD full of adults he probably wouldn't have mentioned it but he has two nine-year-old boys and an eight-year-old girl in the back and he's keen to keep their interest. Our carefully planned itinerary, a mix of self-drive and internal flights, took us from Cape Town along the Garden Route to Port Elizabeth and finally to the North West Province. We mixed game viewing with more mainstream holiday experiences in an effort to keep the whole family happy. The excitement (and education) began on the plane when an unusual flight path took us over Antarctica and the South Pole, low enough to see the icebergs. Could Africa top that? A sneak peek at a nine-year-old's diary reveals the answer. DAY ONE: I think they should have called Cape Town, "cake town" because there was so much chocolate cake. The Luxury Travel Bible says: The afternoon tea at the Mount Nelson Hotel is legendary and epitomises everything this grand dame of a hotel, opened in 1899, stands for: elegance, history and the charm of a bygone era. Although it has to be said the Cape Town Matrons who turn up in their floral-frocked finery do indulge in a rather unseemly rush for the éclairs. Cape Town is South Africa's Sydney, with golden beaches and a rugged coastline for families to explore. The V & A Waterfront complex has shops, craft markets and children's activities. A drive down the coast towards Cape Point brings whale watching and penguin spotting. Luxury Parents Love: The extravagant Librisa Spa at the Mount Nelson Hotel, one of Africa's best. Luxury Children Love: The Boulders penguin colony; the cable car ride up Table Mountain. DAY FOUR: I tried to photograph the monkey but I think HE wanted to take a picture of ME, because he was after my camera. TLTB says: A long day's drive on the lush, green Garden Route was punctuated with an overnight stay at Pezula Resort Hotel & Spa at Knysna. This resort, playground for the well heeled (Roger Federer has a house here) includes tennis, golf, cricket and horse riding all without leaving the grounds of Pezula Estate. A kayak ride down river will take you to the jewel in the Pezula crown: a private castle residence on nearby Noetzie Beach. A drive further east and we arrived at Tsitskamma National Park and Plettenberg Bay. Children will love Monkeyland where primates swing from the trees just above your head, and the Birds of Eden sanctuary, the world?s largest aviary, with a truly amazing selection of 3,000 exotic birds, impressed us all. Luxury Parents Love: The award-winning Pezula Spa; the Pezula Private Castle; Noetzie Beach and its hand-picked staff. Luxury Children Love: Bird's of Eden and Monkeyland. DAY SEVEN: The young male lion wanted to fight the old male, but the old one roared so loudly I put my fingers in my ears. TLTB says: There you have it: the ultimate small boy's fantasy - up close and personal with lions on day two of a safari experience. Kwandwe Private Game Reserve in the malaria-free Eastern Cape delivered in style. Our incredibly child-friendly guide, Paul, seemed to find all those things children love: skulls, dung beetles and of course the BIG game. Bull elephants, rare black rhinos, and a cheetah after a kill - we saw it all. I worried because wild animals never appear in zoo-quick succession. 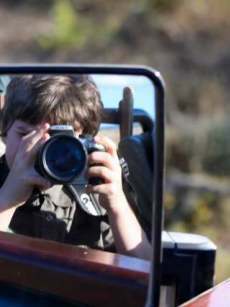 But my son occupied himself on long game drives by taking his own photos with my old camera (I recommend that one), and soaking up the hypnotic atmosphere of the bush and all the information Paul and our tracker Digby could give him. Luxury Parents Love: The gin and tonic at sunset; the private plunge pools. Luxury Children Love: The staff who become new-best-friends; the animals. DAY TEN: The lost kingdom in the jungle has the world's best water slide called the Temple of Courage. TLTB says: The wacky extravagance of the Sun City complex, in the Bushveld of South Africa's NW Province is the perfect antidote for kids sick of serious safari-ing, although the malaria-free Pilanesberg National Park is nearby. The five star Palace of the Lost City at Sun City is a fantasy of over-the-top design and indulgence. So go with the flow and enjoy the faux elephant tusks, the domed ceilings frescoed with wildlife scenes, the zebra striped thrones ...the sheer audacity of it all. The complex, which includes three other hotels and two casinos, boasts 'a million thrills' in one destination from the spectacular Valley of the Waves water theme park to a quiet horse ride in the bush. Luxury Parents Love: Two 18-hole, par72 championship golf courses. Watch out for the water hazard at the 13th on the Lost City course it is home to 20 live Nile crocodiles. Luxury Children Love: The heart-stopping water rides and wave pool at Valley of the Waves; close encounters with real live 'Jumbos' at Elephant Wallow. DAY TWELVE: Wildebeest are a bit dumb, so lions can catch them really easily. TLTB says: Madikwe Safari Lodge near the Botswana border was our second venture into the wild. As this was also an &Beyond lodge (as Kwandwe had been) another Planet Manager Kids Pack with animal-spotting book greeted us on arrival: this time we ticked off elephants, lions, giraffe, eland, impala, springbok, zebra, wildebeest, wild dog and many more. True to form our guide, Gareth, and the rest of the staff proved equal to the task of entertaining children. This included enlisting our boy to help wash safari vehicles, learn how to recognize various animal tracks, and be a trainee chef in the kitchen. Luxury Parents Love: The termite mound-inspired designer architecture of the camp; the in-room massage; the food. Luxury Children Love: Cooking bush biscuits for afternoon tea; the animals. DAY THIRTEEN: A small plane took us from the airstrip at Madikwe to Johannesburg for a big plane home. On the plane mum asked me where I'd like to go next - RIO, of course (TLTB: after the new animated movie of the same name). What is the ideal age for a child's first Safari? Lodges that allow kids have different age restrictions: usually between 6-8 years is the lower limit. 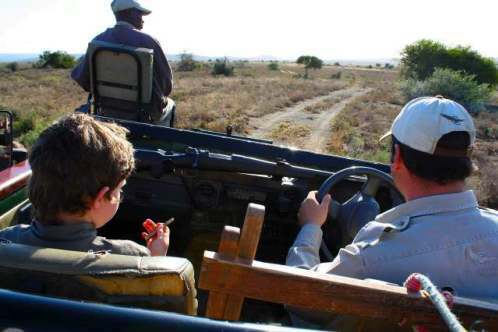 Check whether this means kids can actually go on safari vehicles; some won?t have younger children on game drives even if they can stay in-house. Obviously, the maturity of your child comes into play. Personally I think 9-10 is the youngest age children can really appreciate the experience. How do I find the right camp? Look for camps that specifically call themselves family- friendly. Some will allow children but don't really cater for them. It is always best to go to a camp where there are more likely to be other children. Safari company and Beyond (see Luxe List) are known for their eco-friendly approach and for having luxury camps that genuinely welcome children. Pick malaria-free areas to save dosing children with unnecessary drugs. How long should we go bush for? A maximum of two or three nights is ideal. If you wish to go for longer, visit two different camps and plan other holiday activities in between. Is it advantageous to travel with other families? This is an ideal situation because larger groups can rent private houses within established reserves and thus have exclusive vehicles and game drives which specifically cater to them, for example, Getty House, Phinda Private Game reserve or Kwandwe Uplands Homestead, Eastern Cape.